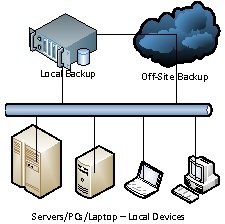 A backup is a copy of some or all data, applications and operating systems. A hybrid cloud backup solution gives you the best of both worlds (Local and Remote storage locations), so you can take advantage of external resources when it makes sense for your business. Decisive IT work with your to find the right solution to fit your budget, Disaster Recovery requirements and retention periods. We work with Microsoft, Dell, Acronis and Symantec as well as hardware NAS, Network Attached Storage, providers. A hybrid data backup solution automatically backs up critical data to a remote server in the cloud, while a local backup is typically performed using a drive on the local network which is shared or a network attached storage (NAS) device. In the event that the local backup fails, the cloud storage and backup assures that data can be recovered to any location in the event of a data loss. Normally a complete backup of all Data, Applications and Operating System which means that if the main copy of the data is lost, you can just copy the data back from the backup. Selective Full would normally be just Operating System or Applications or Data. Differential backups copy all the data since the last Full backup whereas Incremental backups copy all the data since the last Incremental. Basically this is the amount of time your wish to retain copies of your data so that you can restore if you have a problem.